I’m Jo Ann Simmons, a licensed professional coach with over 25 years of counseling experience. I am PASSIONATE about helping vibrant single women 50+ get ready to meet the LOVE OF THEIR LIFE! Believe it or not, your soulmate is yearning to connect with you! However, you may be unconsciously blocking that connection from happening because you are pushing love away — and you may not even realize it. I specialize in helping you identify and clear out old beliefs that keep you feeling stuck and unhappy. I am a seasoned Coach who has created a unique attraction system that led to finding and marrying my own soulmate husband. Today, I offer my clients these same powerful tools designed to magnetize your soulmate into your life. Because it’s a dynamic tool for helping singles of all ages and stages clear a path for amazing love to show up. Too often unconscious beliefs are holding you back from realizing your dreams. Are you unwilling to settle for a mediocre relationship? Are you ready to skyrocket your life to a much higher level? If so, then INVEST IN YOURSELF and hire me as your coach and mentor. I guarantee you will be glad you did! Are you finally fed up with getting poor results? Are you open to receiving encouragement and guidance that can transform your life? Your most important commitment is to yourself. Can you make and keep a promise to yourself? Are you open and ready to release the negative traps that keep you stuck – yet in your comfort zone? Are you ready to invest in a nurturing process that is guaranteed to catapult your life to new levels of excitement? If you said YES to those questions … let’s begin. Together we can bring back the enjoyment of dating as you progress along your path to finding true love. All you need are the tools necessary to elevate your life to the vibration of joy and happiness – while leaving struggle behind. Let me help you clear the way to a loving committed relationship easily and stress-free! Download your FREE GUIDE: How to Attract Your Soulmate… Quickly! The information you provide will be used to send your free e-book, as well as updates, regular emails, and promotions.Your privacy is important to me.No spam! STOP LOOKING and LET TRUE LOVE FIND YOU! How do you know if coaching with me is right for you? Simply click the pink button below to schedule a complimentary 60-minute “Find Your Soulmate Breakthrough” consultation with me. Schedule your FREE 60-Minute “Find Your Soulmate Breakthrough” Consultation Now! If you have been single for a while and dream of having a long-term relationship but don’t know where to start, I provide you with insight, exercises, and tools necessary to lift emotional barriers and build self-esteem. That’s the key to attracting the best highest quality long-term relationship you’ve ever had! 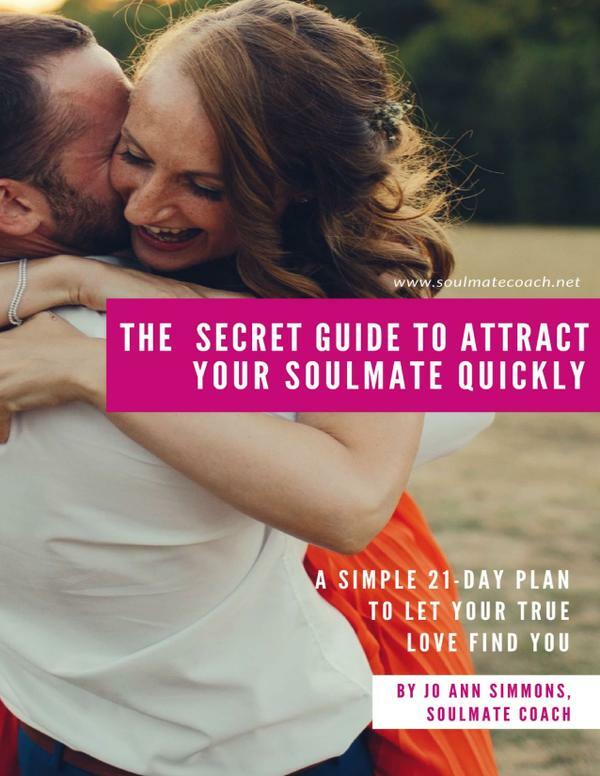 Not sure if Soulmate Coaching is the right path for you? “Find Your Soulmate Breakthrough” Consultation With Me! Jo Ann Simmons is a miraculous life coach, who is passionate in helping others attract their beloved soul mates and partners. Jo Ann gave me the tools to know exactly what I wanted in a husband, to discern what I bring to the table, and to clear the path of my own unconscious resistance. Through her professionalism, life experiences, and intuitive gifts, Jo Ann facilitates healing by lovingly diving deep into wellsprings of important and crucial questions. Jo Ann, has helped me tremendously to get a clear list of quatlities I would like in a commited relationship. She was able to help me clear all my fears and blocks from past relationships. Jo Ann was able to help me tune in to the traits I want in a man. I have so much clarity and a general peace of mind. I was able to find a way to meet men that was comfortable and felt right for me. Jo Ann is a compassionate and trusted coach with years of expertise behind her. She understands how to heal and create new relationships by attracting the right person in your life. I highly recommend her coaching services. I recommend the services of Jo Ann Simmons as a trusted coach unequivocally. She is a great guide for those that are seeking clarity in life, love and relationships. She is honest and trustworthy. She knows how to inspire the people she works with. Being coached by her helped me more than words can describe. Jo Ann is an experienced certified coach whose strategies and techniques are highly effective in helping clients find their ideal relationship. I absolutely recommend her services if you are ready to find that special person. to finally meeting your match.